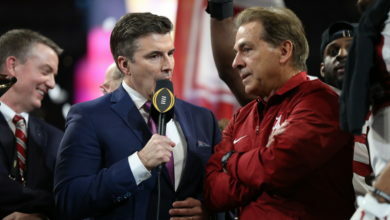 ESPN & Dr Pepper Agree to a Six-Year Extension as an Official Sponsor of the College Football Playoff and Presenting Sponsor of the National Championship Trophy - ESPN Press Room U.S.
Dr Pepper, the first official Sponsor of the College Football Playoff – announced in 2014 – has extended its deal with ESPN and the CFP, through 2026. The brand will also continue its presenting sponsorship of the College Football Playoff National Championship Trophy as part of its broad commitment to college football and its fans. An extended, six-year deal term. Official sponsorship of the Big 12, including the Championship Games. PAC 12 Championship Game Partner designation when ESPN airs the game. Multimedia presence across ESPN The Magazine, ESPN Deportes, ESPN Audio, SEC Network and the forthcoming ACC Network. The unique collaboration consists of extensive exposure for the trophy across all of ESPN’s multimedia platforms during the regular season, including stops along the way at marquee games, as well as select ESPN College Football studio shows and SportsCenter. The trophy will also be featured over the course of the postseason and the College Football Playoff, in anticipation of its presentation to the winning team each year at the National Championship Games, through 2026. In addition to supporting ESPN’s coverage of the College Football Playoff, Dr Pepper is the title sponsor of the Dr Pepper Tuition Giveaway, a season-long program that provides tuition-based awards to deserving students across the country. The College Football Playoff matches the No. 1 seed vs. No. 4, and No. 2 vs. No. 3 in semifinal games that rotate annually among the Chick-fil-A Peach Bowl, Goodyear Cotton Bowl, Capital One Orange Bowl, Allstate Sugar Bowl, Rose Bowl Game presented by Northwestern Mutual and PlayStation Fiesta Bowl. This season’s semifinals will take place Monday, January 1, 2018, at the Rose Bowl Game presented by Northwestern Mutual and the Allstate Sugar Bowl. The national championship game will be Monday, January 8, 2018, at Mercedes-Benz Stadium in Atlanta.